Skin Care at Any Age We specialize in skincare, hair removal, anti-aging products microdermabrasion treatments, chemical peels and spa essentials. 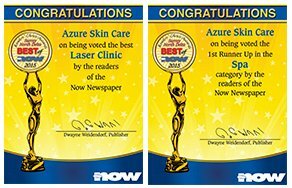 Medical Skin Care Under the expertise of Board Certified Doctors Azure provides the finest medical skin care and anti-aging treatments available. Become a VIP Just $25 per year entitles you to special VIP pricing on our spa and beauty services. Makes a great gift!